*I've been a huge fan of Derting ever since I read the first pages of The Body Finder. I can't wait to read this dystopian; plus, I'm in love with this cover! Thanks to S&S GalleyGrab for this e-galley. Goodreads says, "In the violent country of Ludania, the language you speak determines what class you are, and there are harsh punishments if you forget your place—looking a member of a higher class in the eye can result in immediate execution. Seventeen-year-old Charlaina (Charlie for short) can understand all languages, a dangerous ability she’s been hiding her whole life. Her only place of release is the drug-filled underground club scene, where people go to shake off the oppressive rules of the world they live in. There, she meets a beautiful and mysterious boy who speaks a language she’s never heard, and her secret is almost exposed. Through a series of violent upheavals, it becomes clear that Charlie herself is the key to forcing out the oppressive power structure of her kingdom…." *A big thanks to S&S GalleyGrab for this e-galley. 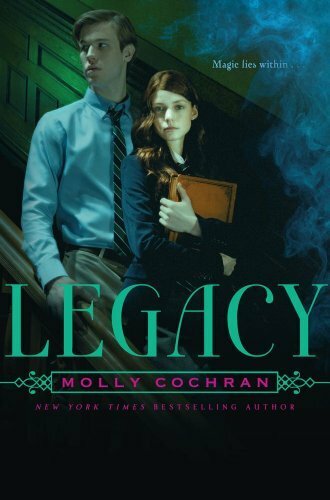 I love boarding school stories, especially when they involve the supernatural. Goodreads says, "When her widowed father dumps 16-year-old Katy Jessevar in a boarding school in Whitfield, Massachusetts, she has no idea that fate has just opened the door to both her future and her past. Nearly everyone in Whitfield is a witch, as is Katy herself, although she has struggled all her life to hide her unusual talents. Stuck at a boarding school where her fellow studens seem to despise her, Katy soon discovers that Whitfield is the place where her mother commited suicide under mysterious circumstances when Katy was just a small child. With dark forces converging on Whitfield, it’s up to Katy to unravel her family’s many secrets to save the boy she loves and the town itself from destruction." *I saw this one over at The Supernatural Snark and immediately bought it afterwards. I love the idea of being transported to 14th century Italy. You guys know I'm a sucker for time travel. Goodreads says, "In Waterfall, American teenager Gabi Betarrini accidently finds herself in Fourteenth-Century Italy . . . Knights. Swords. Horses. Armor. And Italian hotties. Most American teens want an Italian vacation, but the Betarrini sisters have spent every summer of their lives there with their archaeologist parents. Stuck on yet another hot, dusty dig, they are bored out of their minds... until they place their hands atop handprints in an ancient tomb and find themselves catapulted into the Fourteenth Century and in the middle of a fierce battle between knights bent on killing one another." *After reading Revolution, I became a fan of Donnelly and saw this one on sale at the bookstore. I've heard it's brilliant. 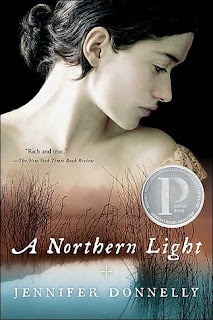 Goodreads says, "Sixteen-year-old Mattie Gokey has big dreams but little hope of seeing them come true. Desperate for money, she takes a job at the Glenmore, where hotel guest Grace Brown asks her to burn a bundle of secret letters. But when Grace's drowned body is fished from the lake, Mattie discovers the letters reveal the grim truth behind a murder. Set in 1906 against a backdrop of the murder that inspired Theodore Dreiser's An American Tragedy, this astonishing novel weaves romance, history, and a murder mystery into something moving, real, and wholly original." Oooh The Plauge! I hope it's an addictive read :) Only(not that I'm complaining my TBR pile is big enough) one book for me this week, it might just be a fab read. Enjoy your new books, Christina. I also loved The Body Finder! I got The Pledge as well it sounds very good. 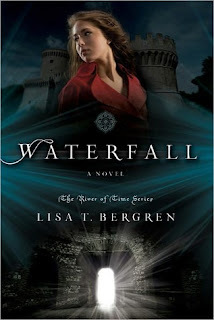 Waterfall also is on my TBR list. Great haul! I loved A Northern Light, I have to read her other books as well. Great malbox. Enjoy! I snagged THE PLEDGE on GG, too--Ironically, the same day I pre-ordered my physical copy! I really enjoyed the RIVER OF TIME trilogy and hope you'll like it, too! Seems like everybody gobbled up their Galley Grab titles as fast as they could. Old follower. Come visit me over at Livre De Amour-Books of Love Blog. Legacy looks good to me. Enjoy! galley grab has some great books right now!! YAY WATERFALL!!! So excited you're going to give it a try Christina, you'll have to let me know what you think:) I can't wait to read The Pledge, I'll be stalking your blog for your thoughts on that one. Thanks for checking out my mailbox, everyone! Hope you have a great week! legacy looks really interesting to me!